This step-by-step legal issues training video will answer many questions like: What liability do you assume when you offer safe deposit boxes? Can money or guns be stored inside a box? Should a power of attorney be accepted as box access authority? What type and amount of liability insurance should you carry? How does the Americans with Disabilities Act affect your safe deposit area? Plus many other important legal topics. Whether your institution has 50 or 5,000 boxes, this safe deposit procedures and compliance training video provides a clear, well-organized system for auditing the safe deposit department before a catastrophe occurs. It helps identify and resolve “mystery boxes” and provides ten keys for improving internal procedures. It also shows a safe deposit attendant on the courtroom witness stand and identifies numerous operations and legal questions that could be asked during any safe deposit litigation. Answers to the “Most Frequently Asked” box rental, surrender, access and key control questions are addressed in this comprehensive training video set. These questions include: What five types of new renter identification are needed? What are the four different styles of rental contracts? What ten important items should be in every “new renter kit”? What ten steps must be performed when a renter surrenders his box or you permit access into your safe deposit vault? Why should access never be granted “before or after” your normal lobby hours? Plus many more topics. 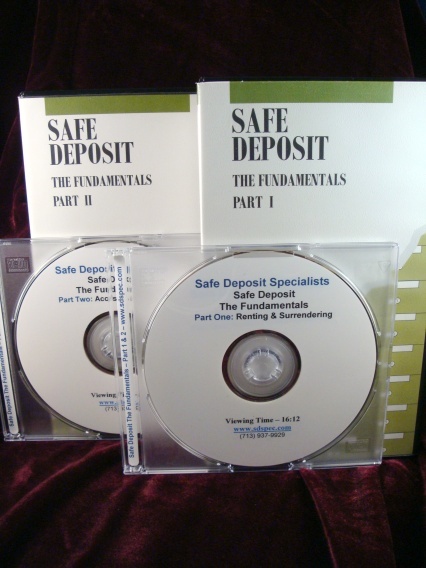 Save $165.00 on our complete safe deposit training DVD package. This DVD package contains the Liability and Legal Issues, Procedures – 10 Keys to Improvement and The Fundamentals DVD set. 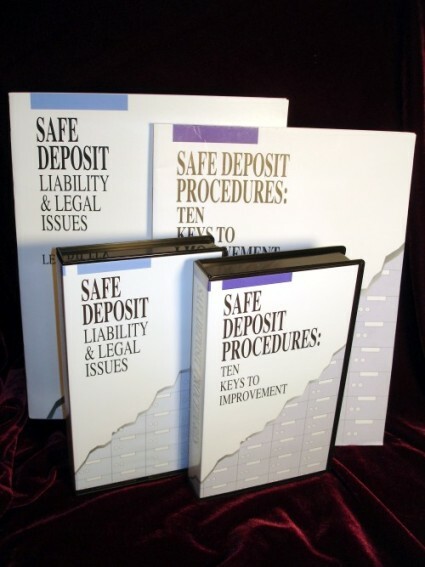 These four DVD’s provide current information on all safe deposit basic procedures, as well as many important compliance, audit and legal controls. A detailed description of the contents of all four DVD’s are listed above. Save $195.00 (while quantities last) when you purchase the Liability and Legal Issues video and the Procedures – 10 Keys to Improvement training video package. These VHS videos cover many topics relating to legal matters and internal audit controls. 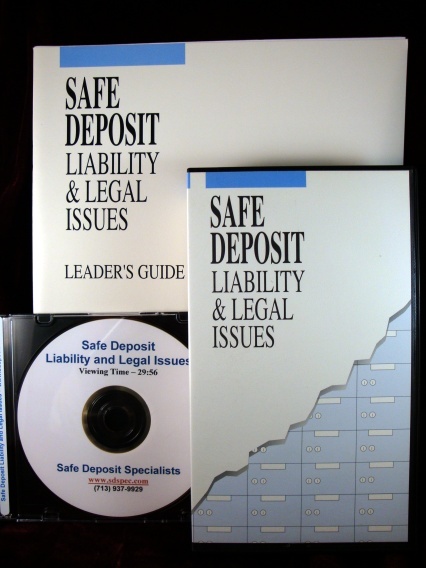 A detailed description of all the safe deposit issues included in each video is listed above. 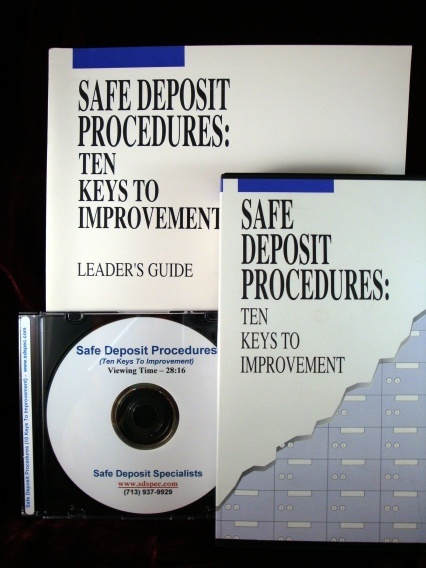 Save $344.50 (while quantities last) on our complete safe deposit training VHS video package. This VHS video package contains the Liability and Legal Issues, Procedures – 10 Keys to Improvement and The Fundamentals VHS set. These four VHS videos provide current information on all safe deposit basic procedures, as well as many important compliance, audit and legal controls. A detailed description of the contents of all four VHS videos are listed above.